Size: 23 x 38 inches. Title: 'To the Right Honourable Charles Earl of Peterborow, and Monmouth, &c. This Map of Africa, According to ye Newest and Most Exact Observations is Most Humbly Dedicated by your Lordship's Most Humble Servant H:Moll Geographer'. "Printed for H. Moll over against Devereux Court without Temple Bar...and Thos. Bowles Print and Mapseller next to the Chapter house in St Pauls Church yard. By Philip Overton Map and Printseller near St Dunstans Church Fleetstreet". 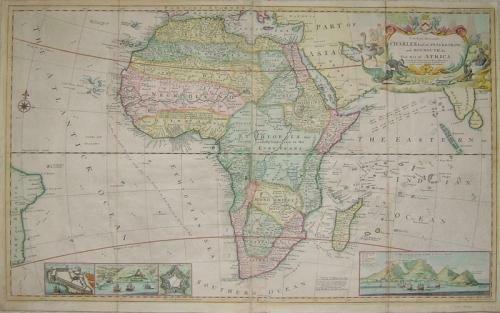 A large and spectacular map of Africa with a wealth of detail and comment. Insets of the Cape of Good Hope, Cape coast castle Guinea, St Helena, and Fort of Good Hope. In very good condition with some expertly repaired tears (a 3 inch tear bottom margin into map 2 inch tear top of map 2 small tears right hand margin, 2 small tears left hand margin. All repaired and stable). Overall very good.